After a month and a half in South East Asia, Brayden and I were looking into flights home to Vancouver. It ended up being WAY more affordable to get a flight from Bali to Honolulu, and from Honolulu to Vancouver. Of course, we had to keep the tropical vibes going so we ended up with an 8-day layover in beautiful Oahu. Although beach chilling for 8 days straight sounds pretty relaxing, we aren’t ones for staying in one spot for too long. So we figured that in order to fully explore the island we’d need a vehicle. Thanks to RentalCars.com, that became a reality! Here are some of the epic spots and some activities that we recommend for your trip to Oahu! 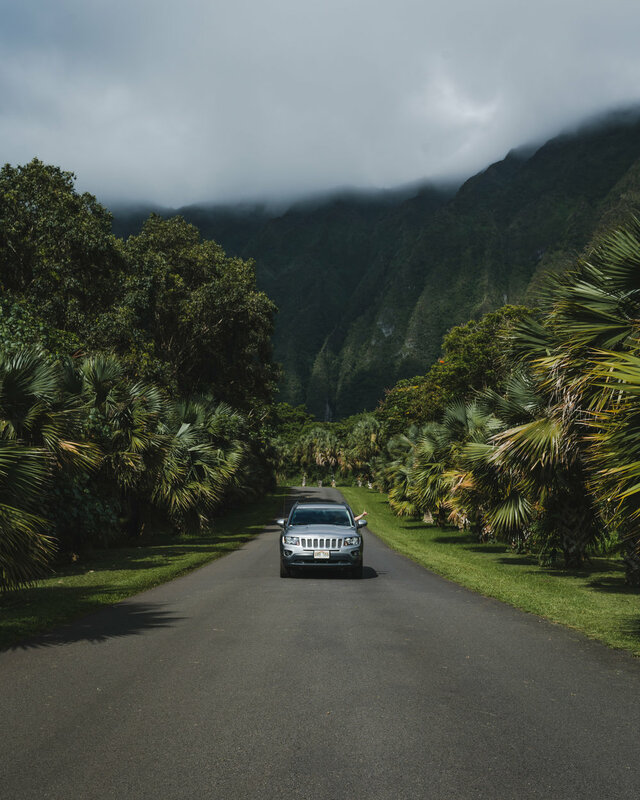 If you’re in Hawaii and looking for lush green fauna and tall mountain ridges this is the perfect spot for a scenic drive. The garden is open at 9 AM every day and it’s free! Oahu has numerous hikes over towering ridgelines, many are not for the faint of heart. Here are a couple of our favourites. The trailhead starts from a beautiful golf course and takes you up and over 3 different peaks. The climb to each peak gets harder, the third being the hardest and most dangerous. We only went to the second peak, next time I’ll push past my fears and top the third. If you plan on doing this hike make sure to bring proper footwear, as there is some rope climbing and muddy conditions. The third peak of the Olomana Ridge, this is the most difficult part of the hike. Can you spot Violetta? Violetta after destroying the climb onto the third peak, she's dope. These man-made notches were created by ancient Oahu warriors for cannons to defend attacks from the Nu’uanu Valley. The cannons were disabled in 1795. We went up this hike for sunset but unfortunately could not climb all of the notches due to extreme winds. These notches are basically chimney rock walls with sheer drops on either side, so it’s important to do them in good weather. Brayden on the First Notch, the rest of the hike hides in the clouds. Whenever I go to Oahu I like to take a day to explore the North Shore of the island. One of my favourite beaches in Hawaii is Waimea Bay. The golden sand is soft to lay in and the waves are always fun to swim in. Just be careful, the waves can be unforgiving, many people get knocked over and caught in the current. I always have to stop Giovanni’s Shrimp Truck. It’s definitely a tourist spot, but the shrimp is to die for! Of course, you also have to watch the sunset at Sunset Beach, it’s a given. 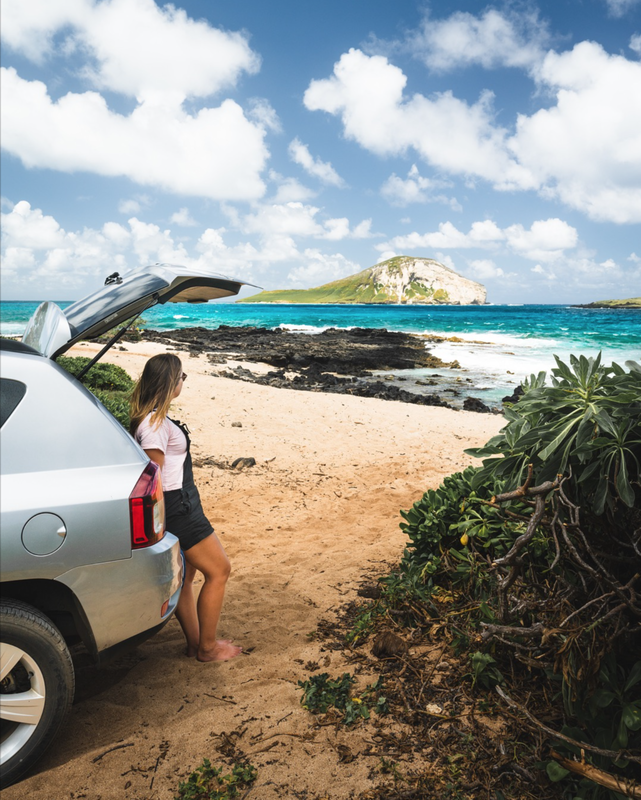 During our exploring on the Island we found the perfect spot to pull up the Jeep onto the beach at Makapuu Beach Park. This is such a good spot for hanging out, swimming, and beautiful views. It would be a perfect picnic spot. All in all, we had an amazing layover. Thanks to RentalCars.com we were able to experience everything we wanted in Oahu.